Russian opposition activist Aleksey Navalny has received a suspended 3.5 year sentence in an embezzlement case, a Moscow district court announced in an early verdict. Navalny was accused of embezzling over $500,000 from cosmetics company Yves Rocher. Those charges can merit a sentence of up to 10 years in prison. 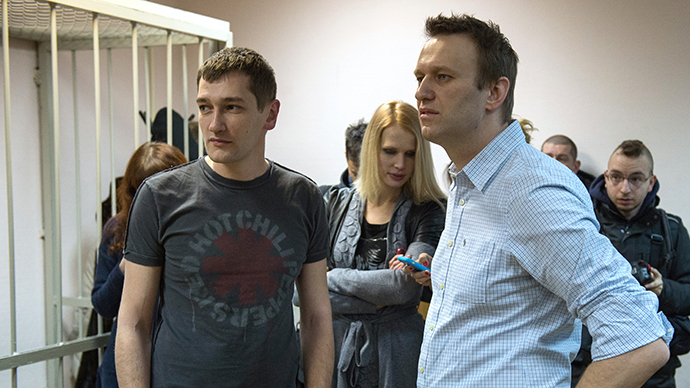 Aleksey Navalny stood trial with his brother Oleg, who was facing an eight-year sentence. Oleg was also found guilty and received a sentence of 3.5 years in prison. Both brothers were each fined 500,000 rubles (US $8,500) and together will have to pay out 4.4 million rubles ($76,000) to a company listed as one of those affected in the case. The Navalnys’ lawyers have already appealed Oleg's sentence. Defying his house arrest, Navalny has arrived to the rally planned in his support on Manezhnaya Square, according to his Twitter page. Minutes after, he was detained by police and taken home. The court's verdict was initially scheduled to be announced on January 15. However, on Monday the court dealing with the case confirmed that the announcement had been moved to an earlier date “because the verdict is already ready.” The rescheduling of the announcement, which was deemed “illegal” by Navalny, caused uproar among his supporters. According to the event’s Facebook page, some 17,000 people plan to attend the unsanctioned by Moscow authorities. Security was beefed up at Manezhnaya Square ahead of the rally planned there by Alexey Navalny’s supporters. The sentence the Navalny brothers got is too soft, according to a ruling United Russia party MP. Mikhail Markelov called on the court to review the case and come up with a tougher penalty. He has reminded that Oleg Navalny was a civil servant while working for the state-owned Russia Post. The criminal case was initiated after managers from cosmetics giant Yves Rocher accused Navalny of major embezzlement in December 2012. The executives claimed the activist – together with his brother, a senior manager in a subsidiary of the state enterprise Russian Post – tricked them into signing a transportation contract with Oleg Navalny’s own company at inflated prices. This company allegedly never provided the services, but instead relied on a subcontract executed by other firms. The scheme worked for four-and-a-half years. The overall amount of money paid by Yves Rocher to the brothers exceeded 55 million rubles (over US$1.6 million at the time) and the pocketed margin was over 20 million rubles ($600,000), according to the claim. Additionally the brothers were accused of laundering the money with the help of a different family enterprise. Officially charged with 30-million-ruble (US$518,000) fraud and money laundering, Navalny has been under house arrest since February. He was banned from using the internet and other means of communication, but continued to update his popular anti-corruption blog by proxy of his wife. Earlier in December, Russian prosecutors asked that Aleksey Navalny be sentenced to 10 years in prison, and also sought to sentence his brother Oleg to eight years behind bars. Navalny has claimed his innocence on all charges, stating that the scheme was an ordinary go-between business. Navalny has repeatedly stated that the criminal cases against him were instigated by the authorities as “revenge” for his anti-corruption activism and forays into political opposition. Some regard Navalny as an instrument of the West. "The idea behind promoting Aleksey Navalny is to make him a political matter, then to place high stakes on him and maybe to use him as a tool for an ‘Orange Revolution’ in Russia," political analyst Aleksandr Selivanov told RT, while saying the image of the activist was "artificially constructed" by the Western media. Back in 2013, Navalny received a five-year probation sentence for taking part in a graft scheme involving a state-owned timber company in central Russia’s Kirov Region.